The $1,000 first prize is sponsored by Iowa Bankers Association. Students submit an essay of 400 words or fewer to the state committee. The essay question and application can be found by clicking here. Essay finalists are announced just prior to Money Smart Week, and the winner reads his/her essay at one or more events during MSW. The poster contest is sponsored by Community Bankers of Iowa (CBI) and open to students in second – sixth grade who design a poster describing the theme: Why is it important to know about money? Posters must be submitted to a participating bank by March 30, 2019, and the winners will be selected by April 30, 2019. First place will receive $600 Certificate of Deposit and second and third places will earn $300 Certificate of Deposit. (Local planning teams may also select a local winner (and offer a small prize) prior to sending all posters in for the statewide judging.) For more information about the poster contest, click here. This statewide program, sponsored by the Iowa Credit Union Foundation, invites grandparents and parents to bring their kids to select credit unions or libraries for a book reading and fun discussion on a money topic. Kids take home the book, one per family. It’s geared to students in 3rd to 5th grade. About 1,000 students played the GeoCache for College Cash game last year, and one student won $1,000 in college tuition, provided by Iowa JumpStart. To play, students find and read 7 posters, each discussing one personal finance topic. Using their mobile devices to scan QR codes, students left answers to seven quiz questions that every young adult should understand–car loans, college loans, cyber security, credit scores, paychecks, debit cards, and budgeting. 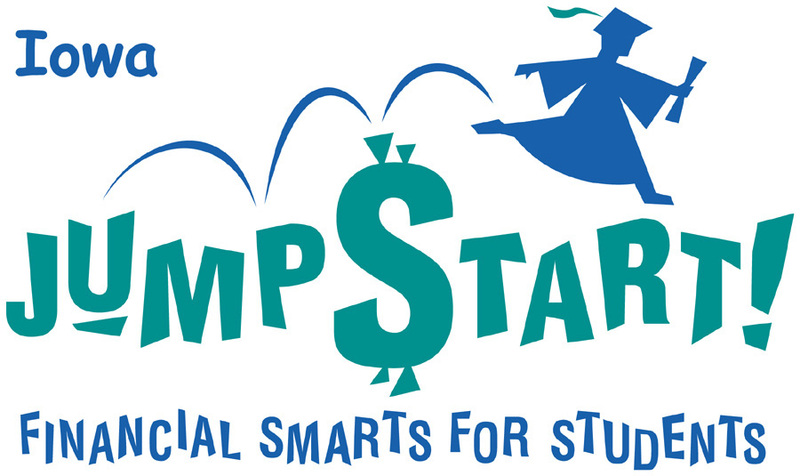 This two-part event is designed to promote saving, and it’s sponsored by Iowa JumpStart. Part one: A MSW partner hosts an event to create and/or decorate piggy banks, and gives a short discussion on saving . Hosts can use cardboard piggy banks, or participants can create one from recycled materials. Part two: Piggy banks go on display at a pageant. The decorated piggy banks can be displayed at a venue such as a bank lobby or library – that’s a local pageant. The Pinterest Pageant – Decorated piggy banks can be entered in the Pinterest contest, sponsored by Iowa JumpStart. For this pageant, take a photo of each piggy bank (bank only, no participants or identification) and upload it to the community Pinterest page. Iowa JumpStart awards a prize for: the decorated bank with the most likes, the piggy bank decorated most creatively, and the host site with the most decorated banks pinned.